The first book Breakers got me interested enough to want to know what happens in the rest of the Series. 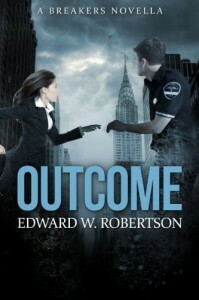 Outcome is a prequel to the first book, but I read it second, the writing in this book was better than the first one, it was very short but interesting to get some back story on the whole epidemic thing. The Characters were likable, I'm hoping to hear more about them. The action is believable and easily pictured in your mind. Overall, I liked the flow of the story better in this one, which may be because it wasn't jumping from one characters POV to the other characters POV, maybe anyway. 15+ for somewhat mature audiences.